The bore that I am, I’m generally not a huge fan of rowdy pubs filled to the brim with pumped up sports fanatics, mainly for the fear of finding a tightly-sculpted mega arm in my face when someone scores or lukewarm beer in my carefully coiffed hair. 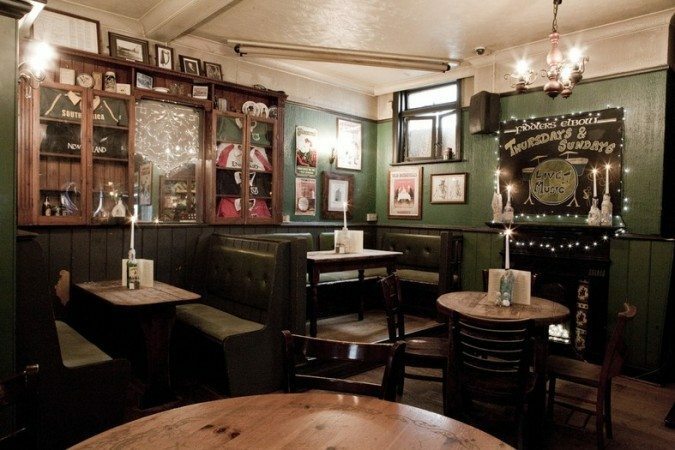 So when I was invited to review Fiddler’s Elbow I was somewhat apprehensive, especially considering it was right smack on the first day of World Cup rugby. But what genuinely perked my interest was the food, which wasn’t being dressed up to be fancy gastropub fare in any way, but the strong Irish slant on the curiously named ‘BeerySeery’ menu seemed worth checking out. From sharing platters full of deep fried goodness, jacket spuds, burgers, ‘tayto sambos’ (Ireland’s favourite crisps lodged between white bread and butter) and comforting Irish staples, everything is pitched at a good-time crowd who crave freshly homemade and locally sourced grub to go with the fantastic on-rotation ciders, ales and lagers on tap. It was a chilly Friday evening and Brighton had just started to stir: post-work hordes were piling in the nearest open door of a boisterous watering hole desperate to bask in the early glow of the weekend and I was roaming down Boyce’s Street, a sliver of a side street, in search of Fiddlers Elbow. It wasn’t hard to spot, there was a smoky haze just outside, Madness blasting out the speakers and noisy laughter echoing off the walls before spilling onto the street. It’s a pretty little gem, a proper old school pub with warren-like nooks-and-crannies and its clean black paint and little hanging baskets outside. Paddy, the incredibly affable GM was hard at work, looking after the steadily growing crowd who were congregating around the 3 large flat-screen TVs, getting ready for World Cup action. The pub had a lovely selection on tap, natch, but apparently they are known for their Guinness, which was flowing like a river this evening. I had a pint myself, which was super silky and had a lovely, properly creamy and long-lasting head. I found a cozy, candle-lit corner below two skylights which were letting in the last of the day’s sun and despite the swinging time around me, found it actually quite relaxing. Classic punk and ska seemed to be the soundtrack of choice for the night, but the pub also boasts DJs and live traditional Irish music on Thursdays and Sundays, which sounds absolutely brilliant and probably a genuinely craic’in night which I’d love to witness. By the time my dining partner-in-crime finally arrived, the pub was going full throttle and I absolutely starving and couldn’t wait to order up a storm. 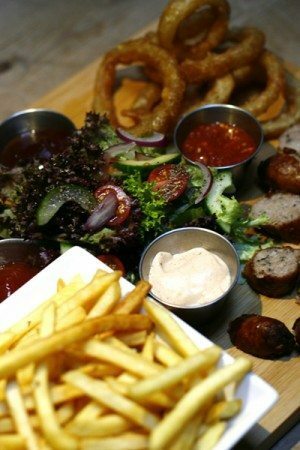 We started heavy with the gargantuan sharing platter, which served up a hefty portion of skinny fries, beer-battered onion rings as well as some of the menu’s greatest hits: the Cajun fried chicken goujons and Brighton Sausage Co. Pork and Guinness sausages. The fried chicken was my absolute favourite. They were seriously good, hand on heart. 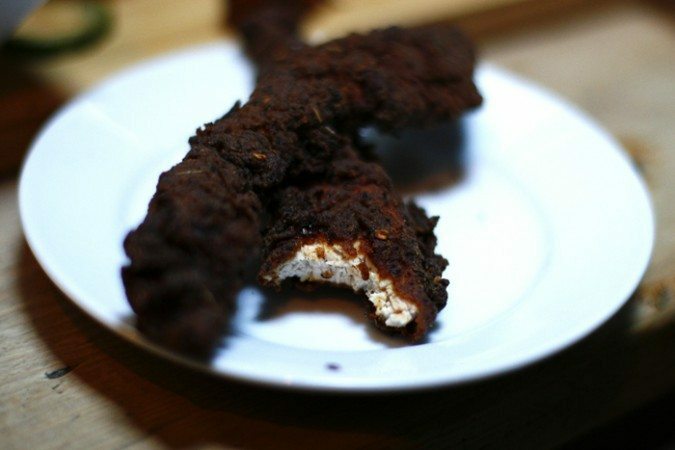 The chicken had a wonderfully salty, crunchy Cajun spiced batter that was deep fried to perfection, much to my arteries’ dismay. Whether stinking drunk or not, this was a shining example of moreish drinking food. The sausages were meaty and lovely, but I have to admit, I wouldn’t have guessed there was a lick of Guinness in there if no one told me. We were so ravenous we ate the entire thing and found we were so stuffed we could only bring ourselves to share a main course of traditional Irish stew, although we eye-balled the beer-battered fish and chips and the Guinness-splashed moules frites. 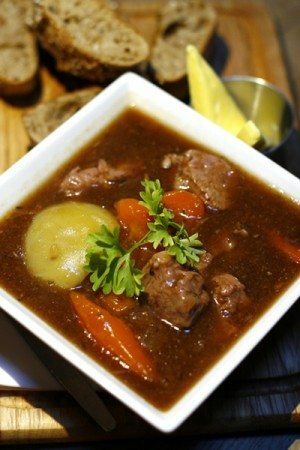 The stew is perfect for colder nights: a hearty warmer of buttery boiled potatoes, carrots and chunky beef in a smooth and savoury broth and toasty soda bread to mop up all the juices with. I’d stick to the Irish dishes, whether it be the stew or pork and Guinness sausages served with colcannon and red wine gravy, but if you fancy typical pub fodder, there’s the standard burger, steak and ale pie, curry and pasta to soak up the Guinness to make way for a more comfortable morning. Unfortunately I lacked the second stomach for dessert but on hindsight, really regret not indulging in the BeerySeery ice cream made with Guinness’ West Indies Porter on a hot Belgian waffle then drenched in chocolate sauce, which is the most celebrated pudding on the menu. The ice cream has a unique flavour that apparently tastes of creamy vanilla and sweet golden syrup and has a hum of Guinness throughout, and of course, all being piled on a warm Belgian waffle with chocolate sauce – I think that sounds well worth indulging in. Despite my obviously naïve initial reservations about going to Fiddlers Elbow, I was pleasantly surprised at the good vibes alive at this gem – no testosterone-fuelled, violent tomfoolery in sight (even on World Cup night), excellent no-nonsense pub grub with a touch of Irish love and a wonderfully quirky, space that reminded me of real, proper pubs that feel like a bit of a an endangered British species these days and so should be celebrated.